Let's face it: The primetime GOP debate got awkward fast, and the audience didn't help. From uncomfortable silences to uncontrollable laughter, the Republican debate audience's worst moments showed just how easily GOP supporters gobbled up the candidates' pandering. Few things are more awkward than silence. At the beginning of the debate, the audience proved that point by adding to the awkward silence created by the candidates and the moderators. Later, though, attendees found other ways to make things awkward: laughing when the rest of us want to face-palm and shouting out of turn when the rest of us want to cringe. It hasn't been all bad, though. The audience booed Trump when he turned on everyone and suggested he might run as an Independent if he doesn't win the nomination. The audience cheered fervently for hometown hero John Kasich (he's the governor of Ohio, where the debate took place). For the most part, though, the audience wasn't necessarily on par with the reaction at home. (But, then again, nothing about this debate was like what we're used to.) On the plus side, at least there was an audience even at this debate. The doors to the earlier debate were closed, and the empty stadium didn't go unnoticed. But the main event came in prime time, so let's not forget the moments when the audience added to the awkwardness of the first Republican debate. A few minutes before the debate started, the moderators called the candidates onto the stage — but the candidates didn't show up. When they finally arrived on stage, the moderators initiated some cringe-worthy small talk, and the audience's silence only made it worse. It was so awkward that even the moderators admitted it. Walker responded to Kelly's question about race relations in the country with a moderate answer. He emphasized training for police forces and discipline for officers who abuse their power. The conservative audience was only mildly enthusiastic, offering a hesitant and weak round of applause. In the middle of one of Trump's answers, a lone audience member shouted in support. That's nothing new — it's the same type of emotional reaction we saw during Trump's announcement speech — but it was the only such moment of the debate. It's the type of reaction that non-Trump supporters hate to see. We couldn't see the woman who approached the moderators, but she apparently caused Kelly to alter the question she was asking the candidates… in an awkward way. Kelly had been asking the candidates if they've gotten a message from God regarding their campaign (so much for separation of church and state?). The audience member wanted to know about what the candidates would do for veterans. It's a fair question, for sure, but Kelly helped to make it awkward by adding it to the God question. This sound bite will probably go down in debate history. When Kelly asked Trump about the disparaging comments that he's made toward women in the past, Trump responded with, "Only Rosie O'Donnell." For his part, Trump made the moment awkward on his own. Still, the audience's reaction only made it worse. The audience — probably somewhat in shock — actually laughed and applauded. Fortunately, O'Donnell responded perfectly. When asked about the changing demographic of the military, including the idea of allowing transgender people to serve openly, Huckabee said, "The military is not a social experiment." As if that weren't bad enough, the audience cheered for him. That's the kind of unfortunately awkward thinking that filled the room all night. 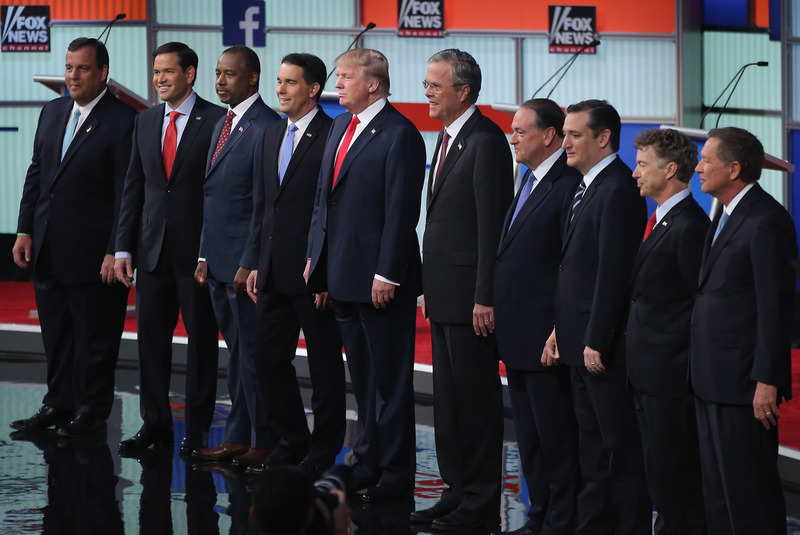 Ultimately, the GOP's first primetime debate was all-around awkward. There were insults, jokes, and plenty of uncomfortable silences to go around. We saw a new side of some of the candidates and an unsettling side of the audience. And to think, this is just the first of many Republican debates coming our way.